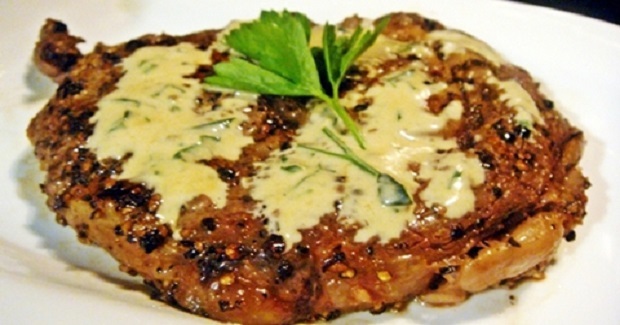 Steak Au Poivre Home Version Recipe - Gutom Na! Posted on Friday, May 27th, 2016 at 4:46 pm. Put the peppercorn is a small sandwich bag and coarsely crush using the bottom of a heavy pan. It is easier if you use mortar and pestle. Spread the peppercorns evenly onto a plate. Sear each side of the fillets for 1 minute and then put your pan into the oven for 5 minutes (medium-rare). Add a few more minutes depending on how you like your steak done. Bring the mixture to a boil and whisk until it thickens. Dip a spoon into the sauce and if it coats the back of the spoon, then it is thick enough. Spoon the sauce over the steak or serve them separately.